After you purchase your equipment and eventually install it in your listening room, you may quickly realize that it certainly doesn’t sound as good as it did in the Dealers Showroom. The primary reason for this is that the Dealer most likely had some kind of sound control products in their showroom that helped realize the true potential of the A/V equipment. Most rooms contain too many hard surfaces(glass, mirrors, wood, concrete, sheetrock etc.) that basically act as a trampoline for the sound waves. The sound continuously bounces off of these hard surfaces and the result is an echo effect and muddled dialog. Installing a series of Acoustic Panels will help control or eliminate the sound waves from bouncing off the hard surfaces. For the most part Acoustic Panels absorb the sound waves. The result is that the listener is hearing more of the sound directly from the speakers , rather than the residual sound that has bounced off of several walls before it arrives to the listener. We tell all our potential clients that regardless of who you purchase your Acoustic Panels from, it is imperative that you include Acoustic Panels in your budget, if not you are sabotaging your investment in your equipment. How is your company different from your competition. In a nutshell, I am an Artist working in an acoustical environment. While the competition is basically a group of acoustic people attempting to work in an artistic environment. I don’t think you can teach too many people how to be a creative. However, it is not too difficult to learn about acoustics for a Home Theater environment. 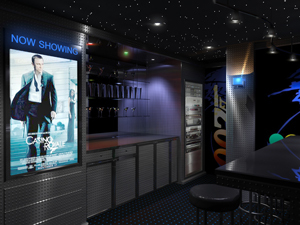 My creativity and artistic abilities allow me to personally customize each Home Theater to the clients personal taste. That includes creating unique designs for each acoustic panel. I don’t think any other company in the industry can create custom panel designs in-house. What is the most interesting project you worked on. We’ve worked on dozens of amazing projects. Perhaps the most memorable project was a James Bond theme that AcousticSmart presented to us. AcousticSmart needed designs for the acoustic panels that complimented their Theater Design. 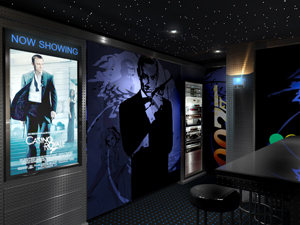 James Bond is probably the best movie franchise to design a Home Theater for. There are so many iconic graphics and images to choose from. You have the cars, girls, opening graphics, villains, weapons, posters and of course the various James Bonds actors. For this particular project we used a form of the famous James Bond bullet hole as unifying background motif. We spent dozens of hours coming up with a final design that the client was happy with. Now he regularly shares his James Bond passion with his high profile friends and clients. For the most part I use 3-D software to create the art. This adds the illusion of depth to the images. In fact, many times people ask me if the art is actually three dimensional. Each design is created so it can be separated into at least 3 unique pieces. This reduces the redundancy and allows for a natural visual flow to the room. After I create the art, I will test it to see how it looks in a Home Theater environment by creating a 3-D rendering of the art in the Home Theater. I have learned that you can’t just create a nice piece of art and place it on eight panels and think that it will make a Home Theater look terrific. There are certain characteristics that the art should have to enhance a Home Theater. One of the best attributes of our art is that I can create really large digital files to print from. If you are buying art through one of the Stock Art websites, you probably won’t be able to find large enough files to effectively create large prints from. If a particular theater requires a series of 4’x6’ panels, normally that would be a great challenge to find art that can be reproduced at that size. I have no problem creating files for that sized panel. Can the panels be effective in any room, or just a dedicated Home Theater? Although the majority of our website highlights the panels in a Home Theater, the panels should be considered for just about any room that could benefit from a sound control product. One 2’x4’ panel in a large living room won’t really do the job. However, one large panel behind the couch with perhaps some panels on the tv wall, will certainly help the overall sound in the room. We have worked with a few restaurants and feel this is a huge, basically untapped, market. We have also worked with several companies to help them control the sound in their Boardrooms. What are the different types of acoustic panels you install — and is there a rule of thumb as far as placement of the various panels is concerned? There are basically two types of panels, Absorptive and Diffusive. The Absorptive panels absorb the sound waves, basically stopping them from bouncing off the hard surfaces of the room. Diffusive panels scatter the sound waves, which helps keep the room sounding “alive”. Too much absorption in a room will create a “dead” sound in the room. If a designs requires wall to wall panels, there needs to be a combination of both Absorptive and Diffusive panels to avoid the “dead” sounding room. There are many different theories about the appropriate percentages of each type of panel. We evaluate each project to determine this percentage. As a general rule you want about 25%-35% of the walls covered in Absorptive panels. If you are installing a greater percentage of panels then you should consider using a combination of both panels. In this scenario, you want to have Absorptive panels in the front part of the room. These panels will absorb the first reflection point of the front speakers. Which means that they will capture the initial sound waves from the front speakers and prevent them from bouncing off walls. You can then place some Diffusive panels in the rear part of the theater. However, you should always consider the type of speakers you have and what type of surface they require in the surrounding area. How does a system integrator go about using your services for design and installation of acoustic panels for a project? If the Dealer already knows the size and quantity of the panels they require, we can deliver the panels in about 4 weeks. However, if they need assistance to determine the size, quantity, and location of the panels we offer complimentary renderings and layout service. 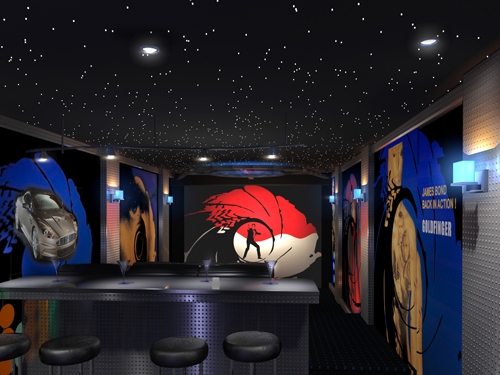 The renderings give the clients a realistic image of what their theater will look like and they also allow us to come up with a general design and layout of the room. The panels come with two rings on the back, we also supply anchors and screws. So basically the panels are hung on the screws, similar to hanging many pieces of art. What would a ballpark budget range be for a moderately sized home theater installation of acoustic panels? A typical theater may have 7 3’x6’ panels. The general retail price for this is about $4500 + S&H. That being said, we evaluate each project and produce a layout that makes sense for that particular space and obviously the clients budget. So if their budget is only $3000 we can alter the size or quantity of the panels to fit into their budget. About Glen Hoffman, 3-D Squared Inc.
Glen Hoffman, the founder of 3-D, has been working in the Home Theater industry since 1998. He originally worked for a Home Theater company creating photo – realistic renderings. There was a wide format printer next door. After learning about the possibilities of working with wide format prints, Glen started creating digital art that could be printed on canvass. He eventually expanded on this concept to create art that could be printed on acoustic friendly fabrics, which is wrapped around acoustic panels. In 2003, he formed 3-D Squared where he created an extensive portfolio of customizable art for Home Theaters. 3-D Squared is now considered the industry leader in creating decorative acoustic panels and prints.